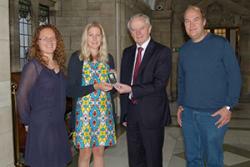 L-R: Professor Nicky Callow, Dean of the College of Health and Behavioural Sciences, Helena Robinson, Professor John G Hughes, Vice-Chancellor and Dr Edgar Hartsuiker.Following Sierra Leone has being declared free of the Ebola virus, a Bangor University PhD student has been awarded a medal in recognition of her bravery and dedication in tackling the crisis in West Africa. Helena Robinson, 29, from Guernsey, is a postgraduate student at the School of Medical Sciences and was awarded the Ebola Medal following her five-week deployment to Sierra Leone in December 2014. After hearing an appeal for medical support staff on BBC Radio 4, Helena investigated online and found that Public Health England had set up diagnostics labs in Sierra Leone and were short of workers over Christmas. She applied to volunteer and was assigned to the Kerry Town treatment centre which was run by Save the Children. Helena explained: “I was quite surprised to receive this medal but it is nice to be recognised for doing something useful, although I am sure there are many people doing admirable work that haven't been recognised for it. "Our job was to test samples - blood or swabs, for Ebola and malaria which share a lot of the same symptoms. It is a fairly simple thing to do but still required a lot of concentration to make sure we stayed safe and there was no cross contamination between samples. The heat was also an issue as some of the reagents we were using were very heat sensitive so we needed to work fast. It was very challenging but very rewarding and I am really glad I volunteered. Dr Edgar Hartsuiker, Helena’s PhD supervisor, said: “Helena is currently doing her PhD research project in the North West Cancer Research Institute which is funded by Tenovous Cancer Care. She is an excellent student and it is fantastic to see that she has been able to apply her laboratory skills for such a good cause, we are very proud of her"
The UK government plans to issue the Ebola Medal to over 3,000 military and civilian personnel who travelled from the UK to the region to contain the spread of the disease.